30,000 Followers on Facebook GIVEAWAY! This month’s Stallion Spotlight features Orb, a Kentucky Derby winning son of Malibu Moon that was bred and raced by longtime Claiborne clients Stuart S. Janney III & Phipps Stable. Breeding: Orb was a homebred for the iconic partnership of Stuart S. Janney III & Phipps Stable. Between the two families, or in partnership of the two you find some of the great horses in history: Personal Ensign, Bold Ruler, Coronado’s Quest, Ruffian, Easy Goer, Buckpasser, My Flag, and Point of Entry just to name a few. 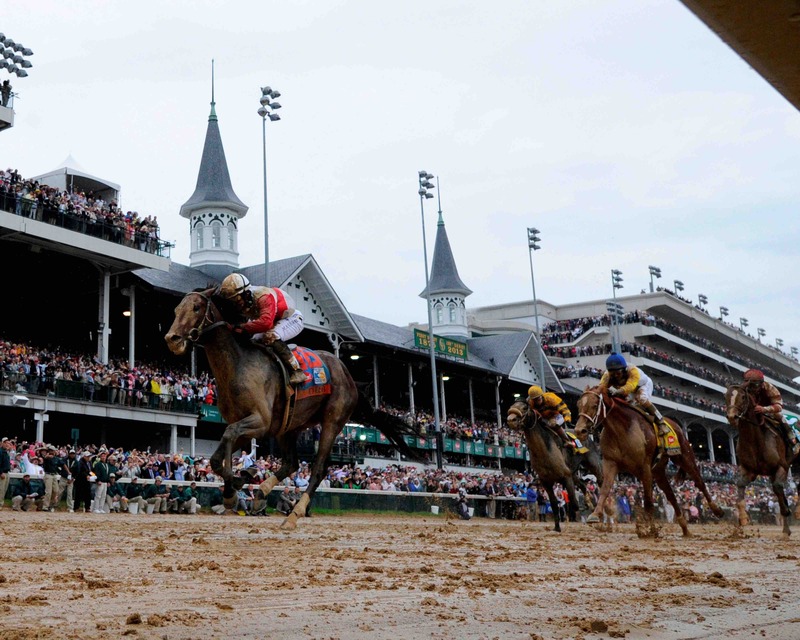 The families’ partnership with Claiborne farms has been a defining factor in the industry over the past 50 years, however the ownership group nor their trainer Shug McGaughey had managed to win a Kentucky Derby – that is, until Orb came along. Orb is by Malibu Moon out of the Unbridled mare Lady Liberty. Bred on the popular and productive A.P. Indy – Unbridled cross, Orb is as well-bred a horse as you can find. A 4-time winner in 23 starts, Lady Liberty was a durable race filly and was competitive (though unplaced) in graded stakes company. Orb’s second dam is the G2SW Black Eyed Susan winner Mesabi Maiden. If you go all the way back to Orb’s fifth dam you will find Shenanigans – a wildly productive broodmare and most notably the dam of Ruffian, one of the top race fillies in history as well as Buckpasser, a useful sire himself. Malibu Moon is a son of A.P. Indy who was precocious at 2, however his race career was cut short due to a slab fracture of his right knee. What Malibu Moon left behind at the racetrack he has more than made up for in the breeding shed. Beginning his career at a modest $3,000 fee in Maryland, Malibu Moon sired an impressive 10 black type runners in his first crop, including the Grade 1 winner Moon Thistle. In just four years he was moved to Kentucky to Spendthrift Farm where he will stand for a fee of $75,000 in 2019. Malibu Moon has sired 1 champion and 47 graded stakes winners to date. Race Record: Orb’s career on the racetrack spanned 12 races during which the bay son of Malibu Moon amassed over $2,600,000 in lifetime earnings. Orb broke his maiden at 4th asking in a stout maiden special weight field that included the likes of eventual graded stakes winners Freedom Child (also a son of Malibu Moon) and Revolutionary. After winning his next start in allowance company, Orb begun carving his way to the Kentucky Derby in sunny south Florida, winning 2 key Derby prep races in the Gr. 2 Fountain of Youth as well as the Gr. 1 Florida Derby. From there, it was all eyes on the first Saturday in May. Over a sloppy racetrack, which he had minimal previous experience with, Orb raced well off the pace and charged late to win the run for the roses by 2 ½ lengths as the 5-1 post time favorite. This marked his fifth consecutive victory. Orb raced 4 more times after the Derby, all of which were in Grade 1 company. Fourth in the Gr. 1 Preakness and third in both the Gr. 1 Belmont as well as the Gr. 1 Travers, Orb had certainly left his mark on the racetrack. He retired to stud at his birthplace, Claiborne Farm, in November of 2013 for a fee of $25,000. 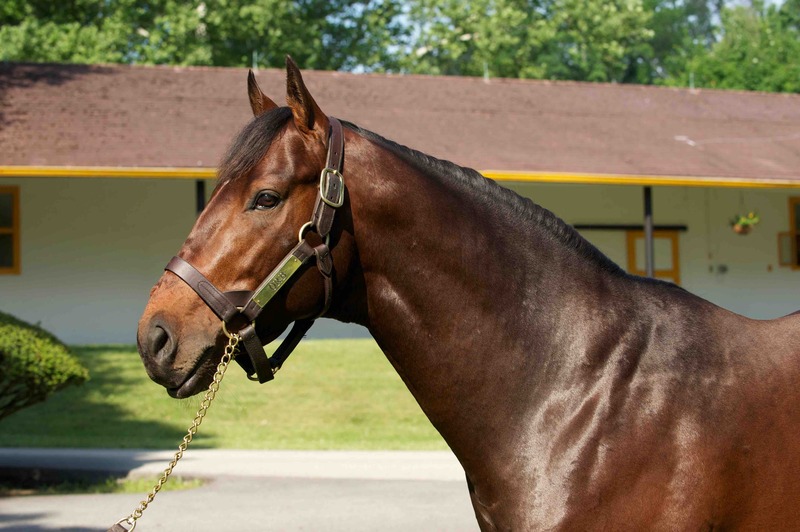 Stud Career: With his oldest progeny now 4, Orb’s career as a stallion is just getting rolling. In 2018 Orb sired his first Grade 1 Stakes Winner when Sippican Harbor bested a field of 11 to win with Spinaway Stakes at Saratoga. To date, Orb has sired 3 blacktype winners and 66 total winners from 131 starters. Orb’s progeny has also been well received at public auction. His yearlings have fetched prices as high as $1,000,000, and his 2 year olds have sold for up to $1,250,000. We look forward to watching Orb’s coming generations on the racetrack! Firstly, how long have you been with Claiborne and how long have you been Orb’s Groom? I’ve been with Claiborne for nearly 11 years and I’ve been Orb’s groom for roughly 4 years. Tell us a little bit about Orb’s personality? He can be a little bit of an aggressive stallion, but if you know how to approach him you can get along with him. Does Orb have any quirks/funny habits? When I let him stick his head out of his stall during a tour and I’m talking about him he likes to shake his head up and down like he is agreeing with me. Sometimes you will also hear him in his stall slapping his lips together. What are Orb’s favorite things? He loves his peppermints and also loves to see what he can and can’t get away with. Do you have a favorite story or memory involving Orb? I don’t really have one specific memory. I’ve got a lot of different memories from working with him over the years. Does Orb’s demeanor change much between the off season and breeding season? He can get a little more aggressive during the off season. During breeding season he is a little calmer. 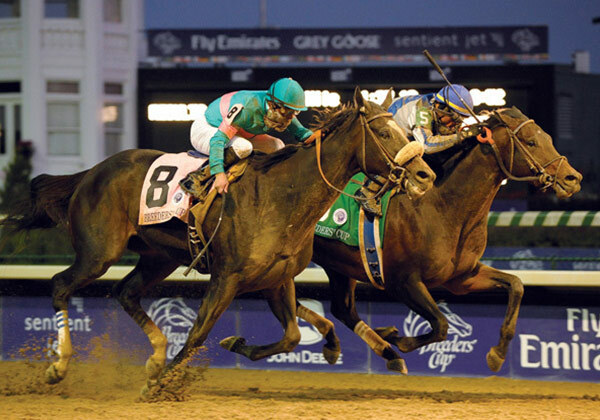 Blame defeats Zenyatta in the 2010 Breeders’ Cup Classic. This month’s Stallion Spotlight features Blame, Eclipse Award 2010 Champion Older Horse and most famously the horse that beat Zenyatta in the 2010 Breeders’ Cup Classic! Breeding: A homebred for Claiborne Farm and Adele Dilschneider, Blame is a son of successful Claiborne stallion Arch out of Liable, a stakes-placed daughter of Seeking the Gold, another star on the Claiborne stallion roster. 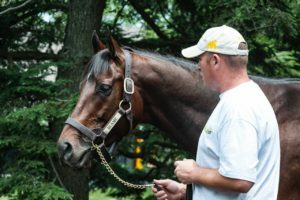 In fact, there are eight stallions in Blame’s four-cross pedigree that distinguished themselves while at Claiborne Farm. They include Princequillo, Buckpasser, Nijinsky II, Danzig and Mr. Prospector. Blame’s powerful female family has also had a close association with Claiborne for over 60 years. His third dam is the aptly-named Special, a daughter of Forli (another Claiborne stallion), and she is the dam of Champion and major sire Nureyev and the granddam of the dominant Sadler’s Wells. Blame’s breeding combines the stamina of the Roberto sire line (grandsire of Arch) with the speed of the Mr. Prospector line. Race Record: A three-time grade one winner of over $4.3 million and Eclipse Champion, Blame’s racing career needs no introduction. After a MSW win at Keeneland at 2, Blame stepped up to graded stakes company during his 3-year-old campaign in the 2009 Gr. 2 Super Derby, and from that point forward was 1st or 2nd in all 8 of the graded stakes he contested. Victories included races such as the Gr. 1 Whitney Handicap, Gr. 1 Stephen Foster Handicap, Gr. 2 Clark Handicap and of course, the Gr. 1 Breeders’ Cup Classic. In his final start, Blame took on superstar mare Zenyatta, and after one of the most exciting stretch runs we can remember denied the great race mare of an otherwise flawless career by a head. After running nine consecutive 100+ Beyers, a unanimous vote named Blame the Eclipse Award 2010 Champion Older Horse and he retired to stud. In 2010, Claiborne Farm was celebrating 100 years of breeding, raising, and racing Thoroughbred horses. It was somehow fitting that at the end of that special year, a homebred colt with strong ties to the farm’s rich history would bring home racing’s biggest prize. Stud Career: Blame returned to his birthplace and bred his first book of mares in 2011, with 109 mares visiting Blame at stud at a fee of $35,000. So far, he has sired 7 crops and sired 25 stakes winners. Blame notched his first Grade/Group 1 winner when Senga won the G1 Prix de Diana Longines at Chantilly, France in June 2017. February was a huge month for Blame, with fillies Blamed and Marley’s Freedom both notching graded stakes on the same day! Blame’s chief money earner to date is Grade 1 Stakes Winner Marley’s Freedom. With 5 graded stakes victories, the 5-year-old daughter of Blame has amassed over $935,000 in earnings. Blamed tallied her second Grade 3 victory on February 17th when she won the Gr. 3 Royal Delta Stakes at Gulfstream for Bill Mott (who had also trained the races namesake, Royal Delta!). Fault, another Grade 1 Stakes Winner by Blame that Claiborne bred, raised, and sold as yearling recently retired from racing and sold at the 2018 Fasig Tipton Night of the Stars in November for $1,200,000 to Shadai Farm. Blame sired 15% stakes horses in 2018, and was ranked #2 of his crop by Lifetime Graded Stakes horses. His 2019 fee is $30,000. Co-Owner Adele Dilschneider and groom Kevin Lay lead Blame off the van to his new home in the stallion barn at Claiborne upon his retirement. Firstly, how long have you been with Claiborne and how long have you been Blame’s Groom? I grew up on Claiborne, so it runs in my blood. My grandfather and father both worked here. I’ve been Blame’s groom since his retirement from racing after the Breeders’ Cup in November 2010. Tell us a little bit about Blame’s personality? Blame is very intelligent and kind. He’s also a very proud and confident horse. Does Blame have any quirks/funny habits? He likes to stick his tongue out at visitors while they’re touring Claiborne. What are Blame’s favorite things? Blame LOVES the mud. Since I’ve been taking care of him he’s come in clean from his turnout about as many times as I have fingers and toes. He also loves his peppermints. Do you have a favorite story or memory involving Blame? My favorite memory is when I got to lead Blame to his stall alongside of (co-owner) Adele Dilschneider upon arriving back to the farm after his retirement (pictured above)! Does Blame’s demeanor change much between the off season and breeding season? His demeanor doesn’t change too dramatically from the off season to the breeding season. He is usually the same cool customer throughout the year, waiting and watching for his next peppermint or for you to say its time to go to work! Mastery with his groom Rodeo Cheek at Claiborne Farm. Claiborne is excited to be kicking off a monthly ‘Stallion Spotlight’ series, where we will feature a stallion each month highlighting their career on the track and as a stallion. In addition, we will give you some insider insight as to what each stallion is like to work with on the farm. We kick off this series with Mastery, an exciting young stallion that entered stud at Claiborne in 2018. His first foals are now hitting the ground, and we couldn’t be more excited about the future for this son of Candy Ride (ARG). Breeding: Bred in Kentucky by Stone Farm, Mastery is a son of world class sire Candy Ride (ARG) out of the winning Old Trieste mare Steady Course. Mastery is a half-brother to stakes winner Clear Sailing. His dam is a half-sister to Jump Start, winner of the Champagne Stakes (gr.I) and now the perennial leading sire of the Mid-Atlantic region. His third dam is a full-sister to the great sire Miswaki. Mastery was purchased by Gatewood Bell of Cromwell Bloodstock on behalf of Cheyenne Stables for $425,000 at the 2015 Keeneland September Yearling Sale. Race Record: Mastery retired as an undefeated Grade 1 winner, going a perfect 4-4 in his racing career. A better team you couldn’t ask for; Mastery was trained by Hall of Fame trainer Bob Baffert and partnered with Hall of Fame jockey Mike Smith for top owner Cheyenne Stables. His dominant victories included the 2016 Gr. 1 Cash Call Futurity at Los Alamitos, the 2017 Gr. 2 San Felipe Stakes at Santa Anita and the Gr. 3 Bob Hope Stakes at Del Mar. Thought by many to be the early favorite for the 2017 Kentucky Derby, Mastery unfortunately suffered an injury in his last career start that lead to his retirement to stud. 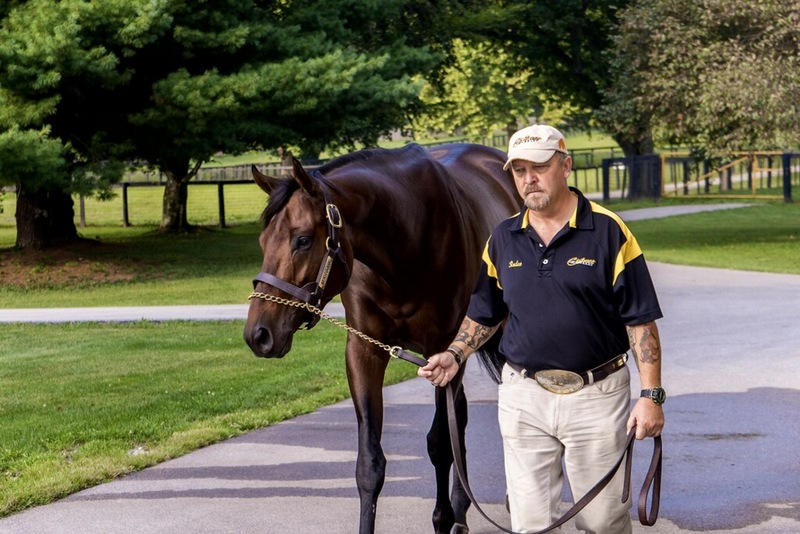 Stud Career: Mastery bred his first group of mares in 2018, and 139 mares visited the first season sire at a fee of $25,000. In his first book of mares, Mastery bred 84 blacktype mares/blacktype producers including the dams of Monomoy Girl (G1) who recently sold in foal to Mastery for $1,850,000 at the Fasig Tipton November Sale & Champion Musical Romance (G1). His career as a stallion is just getting underway as his first foals are just starting to hit the ground, but we are very pleased with his offspring so far and look forward to watching his progeny grow and head to the races! Firstly, how long have you been with Claiborne and how long have you been Mastery’s Groom? I have been with Claiborne for 11 years, and have been Mastery’s groom since he arrived at Claiborne. Tell us a little bit about Mastery’s personality? He is a very smart and kind horse. Does Mastery have any quirks/funny habits? He loves to try to get into my pockets and is always playing with things. What are Mastery’s favorite things? When he first arrived to Claiborne, he was not very fond of treats but now loves them. He also loves to hold one of my brushes while I groom him. Does Mastery’s demeanor change much between the off season and breeding season? He gets a little bit more excited during the breeding season than he typically is during the off season. Can you take up through Mastery’s schedule during the breeding season? He is turned out at night, so in the mornings I bring him in and feed him. Once he finishes eating I groom him, he will then go to the breeding shed and then back to his stall for a few hours. He will go to the breeding shed again in the afternoon, and after that I will turn him back out for the evening. He loves his new job and is very happy at Claiborne Farm! 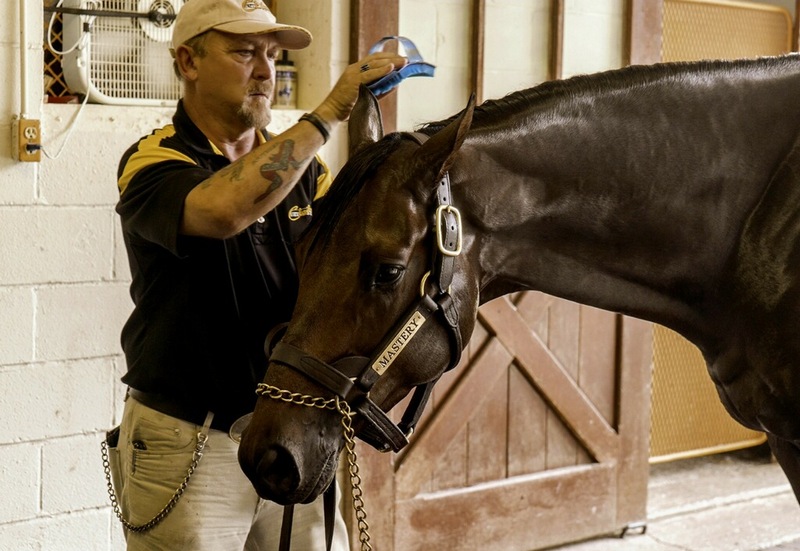 Rodeo grooms Mastery and makes sure he is well taken care of. We’re so close to reaching 30,000 followers on Facebook, and to celebrate, we’re having our biggest giveaway yet! We will announce the winner(s) once we reach 30,000 followers or on 2/28/2019 (whichever comes first). Terms and conditions are listed below.